I did not expect this at all - two tutorials in one, offered by Bobbi. I know her bracelet is the most wanted item in her store, and I am surprised that she is willing to share out how she make them. 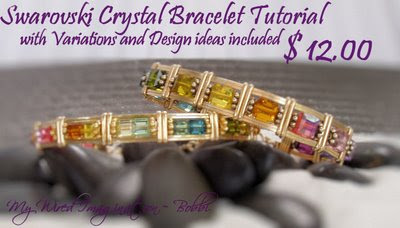 Unlike the usual tutorials, Bobbi's tutorial not only detailed out the secret of making this project successful, she includes another section to include the steps and procedures to make a variation version of this bracelet - it is amazing! Her intention was clear - she is here to teach! The instructions in the tutorial are very clear - Bobbi has very strong command of language, follow what she said in the tutorial you will make this! This item is now available at her Etsy store - you don't have to be PayPal user to buy, you may use credit card for payment!